You need to manually pair teams for a position night or tournament. Your league plays on 3 or more courses. 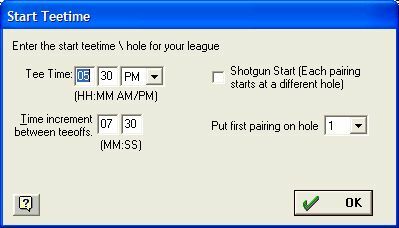 You need to manually assign tee times or start holes. Highlight the event (row) you want to manually pair and click the Manually Pair Teams for event # button. The Start Teetime form appears. Enter the correct staring tee time, increment, shotgun start, and start hole if applicable. Next the Team Paring form appears with two lists. The right list displays the unpaired teams. The left list shows the pair teams. 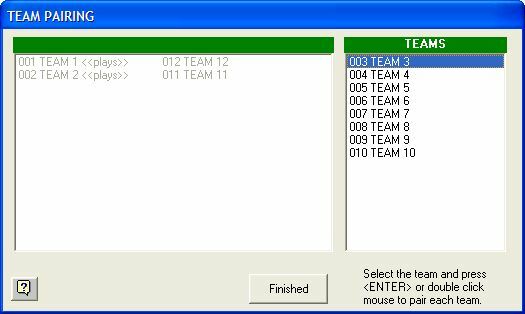 To pair teams, select the first team to pair in the right list and press ENTER. Select the second team to pair, and press ENTER. The two teams are then paired. Do this until all teams are paired. Note: The order in which teams are paired determines their tee time / start hole order. The first pair has the first tee time / start hole, the second pair the second tee time / start hole, etc. If your league plays on 3 or more courses, you will have to manually enter which course each match is played on for some events. Special case: If your league plays on more than one course in any event AND your league does not have opposing teams (play is against the course\field ), the course each team plays should NOT be set using the Manual Scheduler. This is because the Manual Scheduler automatically sets opposing teams to play the same course. If you want teams to play different courses, set the course each team will play on the Team Information Form or Scorecard. Double click the mouse on the match. The Match Form will appear. Select the course for this match. If you want courses automatically filled in for matches to the right of this one, mark the option “Automatically fill in same course for matches to the right of this one”. This is a quick way to place all matches on the same course. The course a team plays can be changed without using the Manual Scheduler. Just pull up the team’s Scorecard OR the Team Information Form and change the course there. 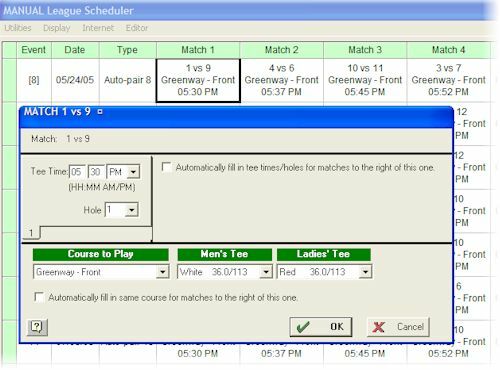 To manually set tee times for a given match, double click the match to pull up the Match Form (shown above). Type the tee time for this match. If you want tee times automatically filled in for matches following this one, mark the option “Automatically fill in tee times for matches to the right of this one”, and type the appropriate tee time increment. Time increments are entered in minutes and seconds.